There is nothing like a developing economic depression for people to start to understand the need for social change. Until now, the average person hasn’t felt the need to become philosophical about his or her lot in life. They’ve generally managed a living, even though it may have meant taking on more debt recently. They certainly hadn’t regarded themselves as wage slaves, although the question did occasionally arise in their minds as to how the super wealthy, at least those outside showbiz and top sport, had really made their millions. As unemployment worsens, people who hadn’t formerly seen the need for fundamental change will start to ask themselves questions, particularly if they’ve lost their jobs. The myriad working on their own particular aspect of social change will see this as an opportunity at least to make to make some headway, if not actually to change society for the better. These reformers would be an estimable political voice were they to unite under one banner but, failing to do so because of their differences, they will be painted by media people beholden to the status quo for their jobs simply as a cacophony of dangerous socialists or fascists. Whether reformers understand it or not, there is one fundamental thing that weaves the disparate threads together: an understanding of where the economic system goes wrong. The Establishment manages to close its eyes to it. Whether in the Middle East, South America, North America, Africa, Australia or elsewhere, the common thread to impoverishment, recession and depression has always been the dispossession of people from the land, or else their excessive indebtedness for access to it. Far fetched? Not at all: we have to acknowledge this most basic point if we are to understand the economic process that visits unemployment, recession and depression on peoples of either the first, second or third worlds. The aboriginal people of any nation understand only too well the effects of dispossession from their lands; they have long railed against its deepest cruelties and absolutely demoralising wrongs. But to this very day, neither church nor state have been prepared to address this fact squarely. You see, it’s more than a little embarrassing, so they’ll apply themselves to specious laws, or to charity and saving souls, instead of to real economic and social justice. 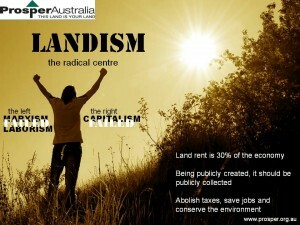 With their slogan “Pay the Rent” (for the land you have taken from us), Australian Aborigines get straight to the point. It is unfortunately implicit in this cry that the rent should be paid only to them, when, for justice to be done to all Australians, an equal part of the surplus in the production process represented by rent should be paid to every citizen. If we have the humility to do so, we can learn a great deal from our indigenous peoples about finally reconciling the people and the planet. As with the abolition of slavery, politicians, the law and the church will follow only when they see the people are serious. Until that time comes, they’ll continue to genuflect to the greedy, powerful few and pay only lip service or prayers to social and economic justice. If the thesis was capitalism and the antithesis Marxism, then the synthesis that grants equal access to everyone beckons all social reformers.